The city is saving Kunia Plantation Village from demolition thanks to a deal worked out with the James Campbell Co., Honolulu Mayor Mufi Hannemann said yesterday. 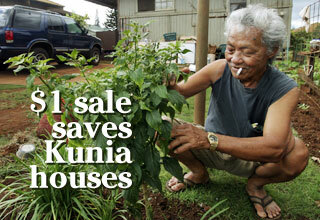 The Hawaii Agriculture Research Center bought the 119 acres for $1. Here, Charles Cabucana, who is retired after working 13 years for Del Monte, worked yesterday in his garden.